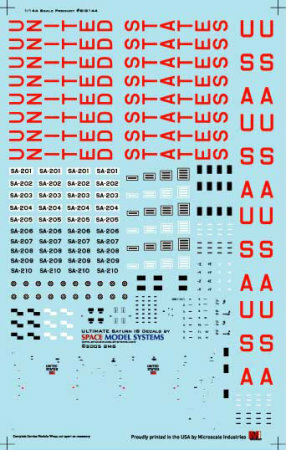 Space Model Systems decals for the 1:144 scale Saturn IB. Sheet includes markings for SA-201 to SA-210, including Apollo 7 and Skylab. Features "corrected" UNITED STATES service module marking for later flights and all camera targets and fin markings. Fully illustrated instruction booklet.